Why The Maldives is 2019’s Hottest Wedding Destination! With Billie Faiers and Greg Shepherd recently marrying and honeymooning in the Maldives, we’ve researched some of the best resorts with amazing packages you need to see! Pristine beaches, clear blue skies, water villas perched overlooking the Indian Ocean, and highs of 29°C…you don’t have to ask us twice! These are just some of the unique experiences awaiting those who choose to celebrate their love in the Maldives. A resort that appreciates its surroundings is Kuramathi Island Resort, as they have a resident marine biologist on this island that stretches almost two kilometres. Wedding: With it being Billie and Greg’s choice of wedding, it certainly is amazing! With white sands and clear waters, there’s a package to suit every couple! You can relax while the experienced team organise your day. Choose between a sandbank or island ceremony, both blissfully close to the ocean. Honeymoon: Honeymooners are treated to champagne on arrival and have an array of twelve restaurants and seven bars to avail from! This gorgeous island remains untouched in many areas, so couples can enjoy deserted beaches and strolls through fresh vegetation when they feel like a trip out of the resort. In the Honeymoon Villa, couples can relax in their ten metre lap pool that adjoins their wooden deck or soak in a bath for two. Then there’s always the LED lit shower to spruce things up! 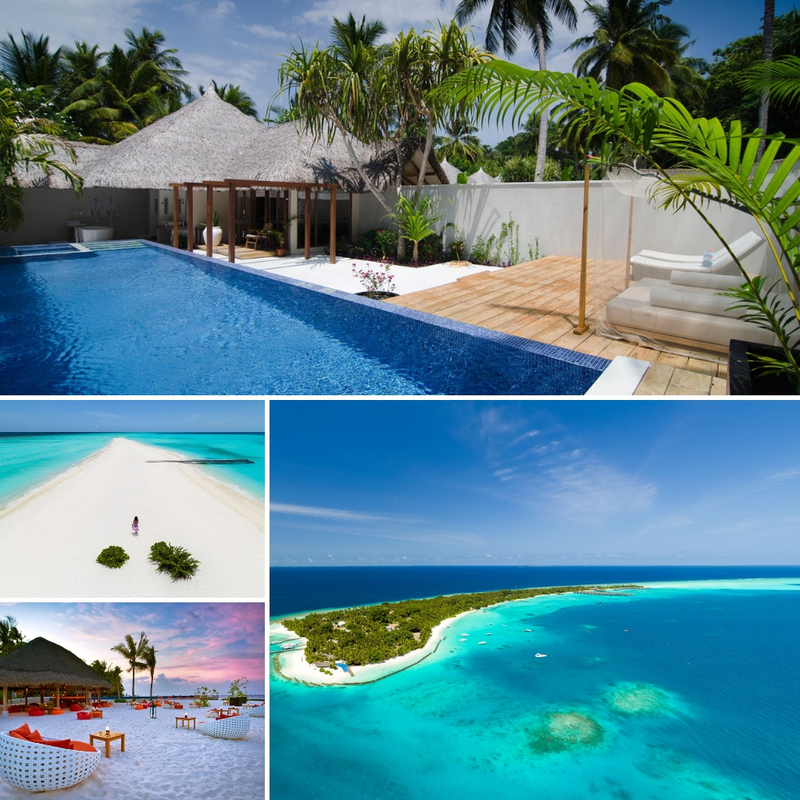 Cost: Kuramathi Island Resort is £722 per night and honeymooners can enjoy an all-inclusive time at their Maldives honeymoon. Situated south of Malé’s coral atolls, COMO Cocoa Island is one of the smallest and most stylish resorts in the Maldives. After a forty minute speedboat trip from the International Airport, couples can begin their inclusive and relaxing stay. Wedding: Couples are able to get married on this island, with the experienced team offering a island buy out for the day and a high level of event organising, from flowers to dinner, so you don’t have to stress! Celebrate in style with family or just the two of you during this private event. Note: weddings at COMO are ceremonial, and not recognised by the law. 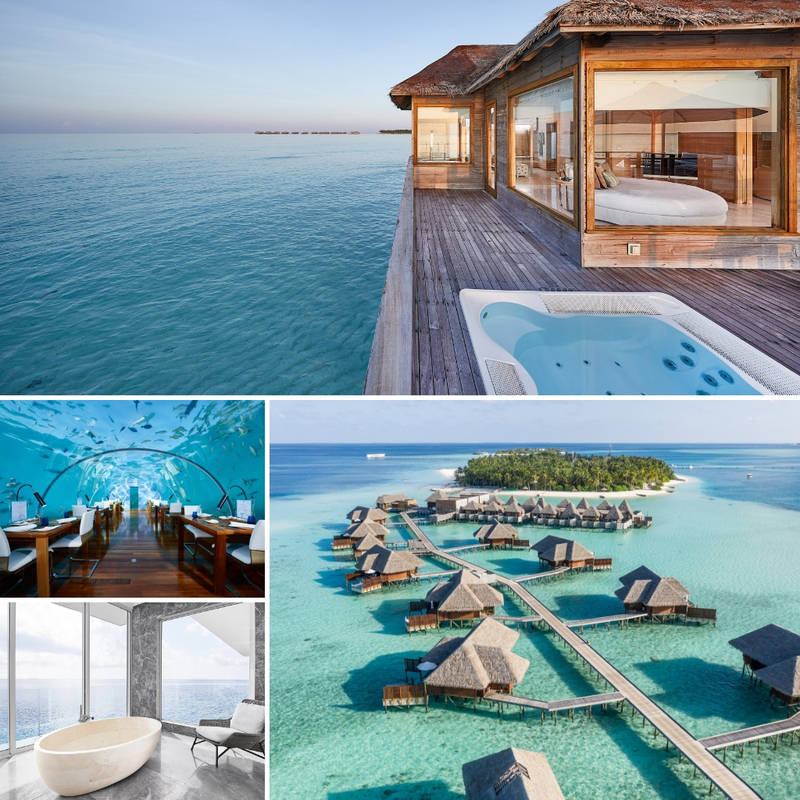 Honeymoon: Relax in either the Dhoni Suites or the Water Villas that come with large secluded decks for ultimate lounging goals or for slipping into the crystal clear and warm lagoon. For more relaxation on their honeymoon, couples can enjoy yoga on the open air yoga pavilion or indulge in treatments in the couple’s treatments room. Experience: On the resort there are customised cruises to other islands and beaches, sunset cruises, UV night snorkeling and sunrise breakfasts. Cost: This stunning resort costs approximately £605 per night. A resort that fits in to its beautiful surroundings, not fitting the surroundings around them, Mirihi Island Resort boasts an amazing house reef right at the doorstep for couples. Situated on the South Ari Atoll, Mirihi Island is the smallest island of the Maldives at 350m long and 50m metres wide. Wedding: Celebrate your wedding with unique style amidst a very romantic setting! Their wedding package includes everything from wedding cake to photographs! The couple can also pay for add ons such as bridal makeup, a videographer or bridal villa. Everything at your fingertips! 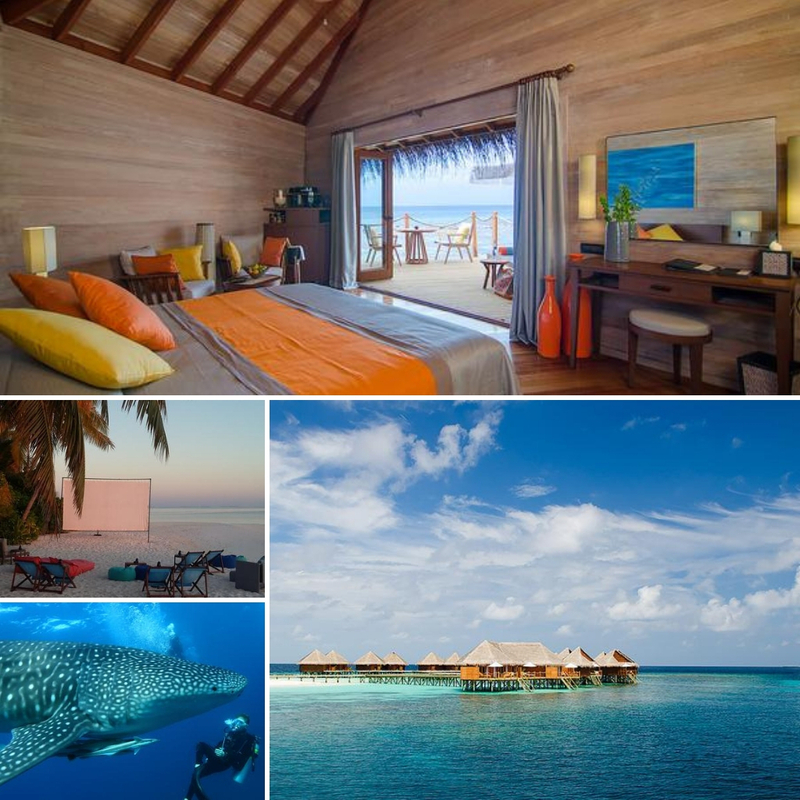 Honeymoon: Enjoy reef sharks, manta rays and sea turtles in their natural habitat while eating breakfast as part of the Maldive honeymoon package. Essentially, you won’t need to go far to enjoy the beach on this honeymoon! The resort is freshly renovated and now boasts a mixture of modern and traditional, including rain showers, sliding doors and complete privacy in the scattered beach and water villas across this small island. Experience: Some of the delights that await honeymooners are diving, snorkeling, a tantalising spa and a private movie night on the beach. 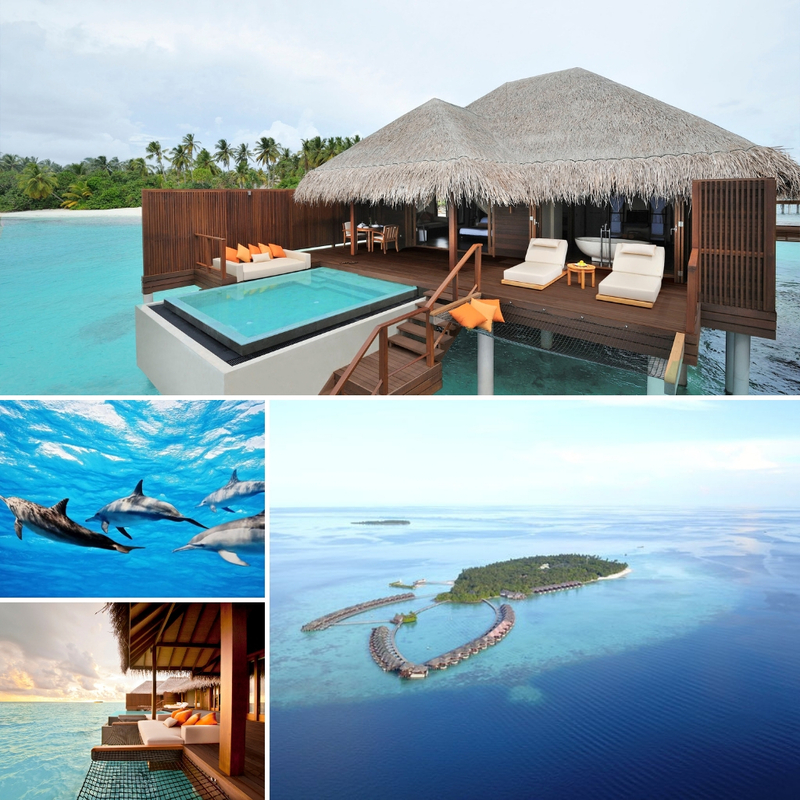 Cost: The beautiful surroundings of Mirihi Island Resort costs around £458 per night and includes all-inclusive treats. 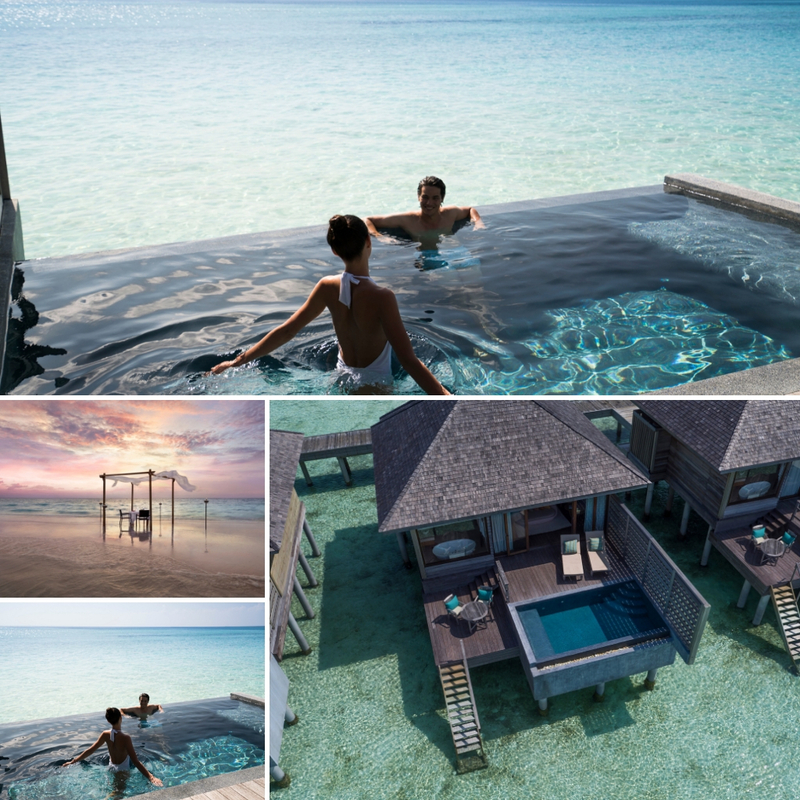 For somewhere that is easy accessed but feels exclusively remote at the same time, Conrad Maldives is the ticket. You won’t think you are only thirty minutes from the main island of Malé! Wedding: The entire atmosphere of the resort screams ‘get married here!’ Every wedding package includes a spa treatment, three-tier cake, decorations, photographer and sunset cruise. Then choose from twelve award winning restaurants to host your meal, including an underwater restaurant! Note: it is also only a celebratory ceremony. Honeymoon: Maximum privacy is the aim at this resort, and is achieved by rarely seeing more than three people on a stretch of beach. Relax in a private colour-changing whirlpool that overlooks uninterrupted views of the Indian Ocean or follow the steps from the private deck into the lagoon itself. For an evening dip, relax in the ocean view bath before an evening of fine dining. Experience: Couples can enjoy a relaxing time in the resort’s over water spa or take part in The Sandbar Picnic – a day trip to a deserted island and enjoy a romantic meal for two. Or for more adventure on their Maldives honeymoon, there is snorkeling with whale sharks or exhilarating water sports like jet packing. Cost: This resort with uninterrupted views of the Indian Ocean costs £596 per night. In this private island resort, staff go the extra mile to meet each and every requested need at Ayada Maldives. Wedding: Each wedding at Ayada takes place in the White Room Chapel, with a Maldivian ceremony master, bouquet, traditional coconut sharing and certificate. The Gold wedding package includes a different option for the ceremony, a three-tier cake and bottle of champagne as well as bridal beauty, private cruise and romantically decorated room. A wedding that sounds hard to resist! 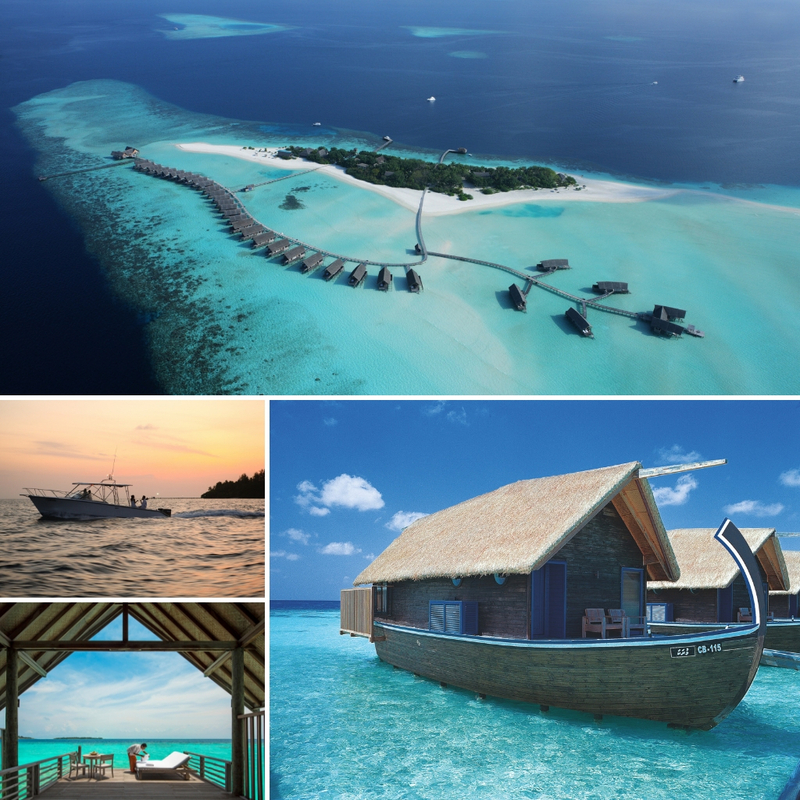 Honeymoon: Honeymooners can enjoy a whirlpool for two as well as a hammock that hangs lazily over the ocean and relax to the sound of the gently lapping waves as part of their Maldive honeymoon package. This can all be enjoyed on an outdoor terrace courtesy of the sunset and water villas on offer from the resort. Inside the villas there are glass floors for when you want to view the underground sea-life from the comfort of bed. This resorts plays hosts to many restaurants too; from an over water restaurant to beach barbecues and wine and cheese delicacies unique to the Maldives. Experience: For unforgettable memories, there are glass boat tours, island safaris, dolphin spotting and traditional Maldivian celebrations. Cost: Visit this beautiful resort for £472 per night, including a Maldives honeymoon package for five nights and all-inclusive treats! The hideaway island where Anantara Veli sits is an adults-only resort so it is perfect for couples who aren’t afraid of a little PDA! Wedding: The unrivalled beauty of the Indian Ocean can be enjoyed as you say your vows at sunset under a floral arch on the sand. After, enjoy a candlelit dinner with family or friends, facing the lagoon. Or, take a trip to a private island and exchange vows on a deck over water before enjoying a barbecue by the shore. Honeymoon: Designed to enjoy the flawless weather, the open planned villas unique to this resort will certainly do just that. And leaving the villa doesn’t have to be an option with local cuisine available for delivery to the suites for these Maldive honeymooners. Hammocks sit throughout the grounds do lounging can be done literally anywhere on the resort. More specifically, the Terazzo tub for two inside the villa is a great spot to overlook the lagoon, as is the plunge pool perched over the lagoon. Experience: On this adults-only resort couples can enjoy a Maldivian cooking class, dining under the stars, jet skiing, parasailing, island hopping and a private picnic on the island Gulhifushi. Cost: Come to this flawless resort for £856 per night including a honeymoon package to cherish from breakfast in bed to Over Water Bungalow accommodation costing £901 for all-inclusive.